If you're all about relaxed dressing when it comes to fashion, you'll love this absolutely chic pairing of a black leather biker jacket and Dondup distressed skinny jeans. Opt for a pair of white high top sneakers to make the outfit current. If you're on the lookout for a casual yet absolutely chic getup, rock a grey horizontal striped poncho with blue ripped skinny jeans. Both pieces are totally comfy and will look fabulous paired together. To bring out a sassier side of you, complement your look with tan thong sandals. 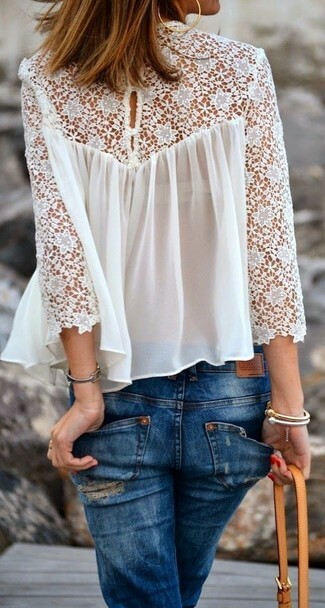 If you're on a mission for a casual yet chic getup, wear a white lace long sleeve blouse with blue ripped skinny jeans. Both pieces are totally comfy and will look fabulous together. 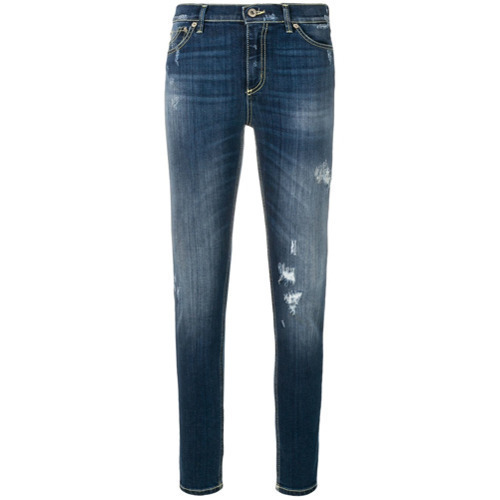 If you're searching for a casual yet absolutely chic getup, try pairing a black coat with blue ripped skinny jeans. Both pieces are totally comfy and will look fabulous together. Why not introduce red suede ankle boots to the mix for an added touch of style? If you're hunting for a casual yet totally stylish ensemble, try teaming a black sequin blazer with blue ripped skinny jeans. Both garments are totally comfy and will look fabulous together. As for the shoes, go down the classic route with black studded leather pumps. If you're on a mission for a casual yet chic getup, pair a beige coat with Dondup distressed skinny jeans from farfetch.com. Both pieces are totally comfy and will look fabulous paired together. Dress up this look with beige leather pumps. Reach for a white and black horizontal striped crew-neck sweater and blue ripped skinny jeans, if you feel like relaxed dressing without looking like you don't care. White leather low top sneakers are a nice choice to finish off the look. If you're all about functionality dressing when it comes to fashion, you'll love this extra adorable pairing of a grey fishtail parka and Dondup distressed skinny jeans. When it comes to footwear, this getup is round off wonderfully with pink velvet slip-on sneakers. If you're a fan of comfort dressing when it comes to fashion, you'll love this stylish pairing of a dark brown vest and Dondup distressed skinny jeans. Rock a pair of tan leather pumps to take things up a notch.